Justinian’s ‘Corpus Juris Civilis’ is unquestionably the fundamental work on law and jurisprudence! Parts of this work were originally intended to be used by law students, but they were not solely used as a textbook – they actually carried legal weight …as law! It includes four distinct parts – Codex, Digest, Institutes, and Novellae – each written with a different purpose. 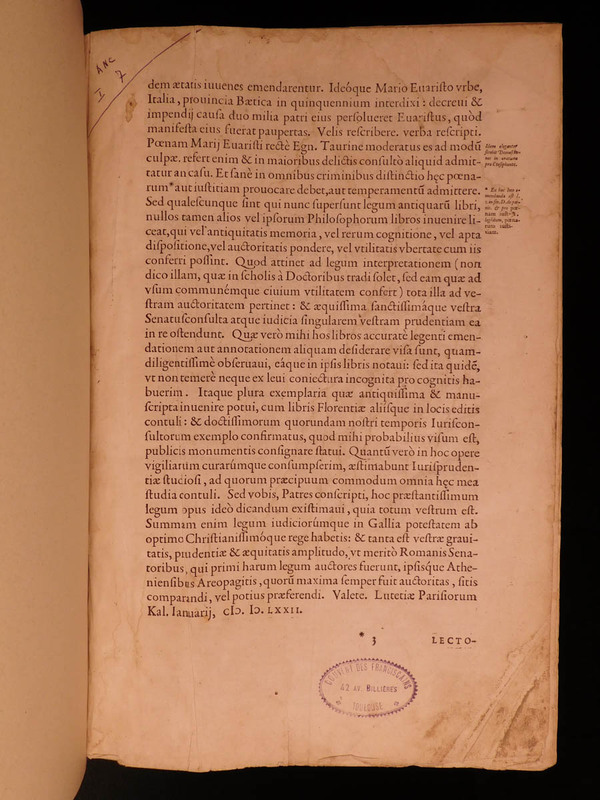 ‘Digest’ or ‘Pandectae’ is a collection of juristic treatises taken from various legal writings of Ulpian and Paulus that became law – the largest portion of the ‘Corpus Juris Civilis’. This extremely rare 1575 edition was published by the Plantin Press, a 16th-century publishing company known for their impressive folios – like this edition! Antverpiae : Ex officina Christophori Plantini, 1575.